Mr Justice Peter Charleton outlined 11 questions he will consider when preparing his latest report. MR JUSTICE PETER Charleton said today he would have to consider if the premise that Nóirín O’Sullivan relied inappropriately on unjustified ground to discredit a garda whistleblower was based on leaks and conjecture. 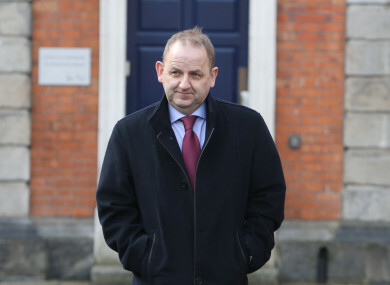 The tribunal, in its current module, is examining whether unjustified grounds were inappropriately relied upon by Nóirín O’Sullivan to discredit whistleblower Sergeant Maurice McCabe at the O’Higgins Commission of Investigation in 2015. The commission, which sat in private in 2015, investigated complaints made by McCabe about certain policing matters and about serious allegations against senior officers including then Garda Commissioner, Martin Callinan. Sergeant McCabe himself has yet to give evidence at the tribunal, and will do so at a future date. Today Mr Justice Charleton outlined 11 questions he said he will have to consider in preparing his report. He said that the first issue was whether false allegations of sexual abuse had been relied upon by the Garda Commissioner. He said that “everyone seems to be agreed that there weren’t”. He said that the question remained whether any other unjustified grounds were inappropriately relied upon by the commissioner. In considering this, the chairman said, he would have to consider were the limits appropriate in cross-examining witnesses, and whether there was evidence the commissioner intended to challenge the credibility of witnesses in an ordinary way. Mr Justice Charleton also said he would have to consider whether a letter setting out the Garda Commissioner’s legal position in May 2018 was “a mistake”, and whether the barrister for the Gardaí made a mistake “in the heat of the moment” at the commission in saying that Sergeant McCabe’s integrity was to be challenged. The chairman said he would also have to consider if there was any evidence of a “dark truth” that the garda commissioner or other senior officers were “going after” Sergeant McCabe at the O’Higgins Commission. The chairman would also have to consider if the Minister and Department of Justice behaved lawfully in leaving any question of legal strategy to the garda commissioner. The chairman said it seemed to him that the O’Higgins Commission had handled all matters before it appropriately. He said he would have to consider whether there was basis for the module or had it been based entirely on leaks and conjecture. Earlier, a civilian witness told the tribunal that former Garda Commissioner Nóirín O’Sullivan was more focused on changing the culture of the organisation than her predecessor. Cyril Dunne, the former civilian chief administrative officer with An Garda Siochana, was today cross-examined by John Rogers SC on behalf of John Barrett, a garda human resources executive. Dunne denies saying to Barrett in May 2015 “we are going after him [Sergeant McCabe] at the commission”. Cyril Dunne told Rogers he was concerned when he saw Barrett’s statement, as it seemed to suggest he had a “directing role” in relation to the garda legal strategy at the commission. In his statement to the tribunal, Dunne said he had a working relationship with former commissioner Martin Callinan, but it was not close and they did not have a relationship outside work. He said he had a closer working relationship with O’Sullivan, “driven by the interest both of us had in change”. “Her focus on what she saw as being important was not so much operational policing but on the culture of the organisation,” Dunne said. He said the two commissioners had different personal styles, and he had much more engagement with O’Sullivan. Dunne, who held a position equivalent to that of a deputy commissioner, said that when he began work with An Garda Siochana he initially had a peer-to-peer relationship with O’Sullivan as deputy commissioner, which he never had with Commissioner Callinan. Dunne, who attended a meeting with Nóirín O’Sullivan and senior officers about McCabe’s experiences of a “toxic work environment” in Mullingar garda station in February 2015, agreed it was “most unusual” that the commissioner would be involved in “micro-managing” a particular station. Dunne said he understood his role at the meeting was to “bring an alternative viewpoint” to the discussion on Sergeant McCabe. Dunne said he was concerned “there was groupthink going on” at the meeting, with everyone discussing whether Sergeant McCabe could be found a different workplace. “Maurice McCabe’s issues may not be resolved simply by finding somewhere different for him to work,” Dunne said. “The problem was Sergeant McCabe was in a situation that was absolutely unsustainable,” Dunne said. Dunne said his sense at the time was the Sergeant McCabe “must be under a severe amount of stress”. Last week, Barrett told the tribunal that he had told Chief Superintendent Tony McLoughlin about Dunne’s alleged comment in May or June of 2015. Today, Chief Superintendent McLoughlin said he had no memory of being told by Barrett of any comments about “going after” Sergeant McCabe by Dunne in 2015. “I have no memory, I do not remember Mr Barrett saying that to me,” Chief Superintendent McLoughlin said. Chief Superintendent McLoughlin said he did recall Barrett mentioning the conversation to him in late 2017 and early 2018, but he told Barrett he did not recall any earlier conversations in 2015. Ken O’Leary, a former Department of Justice deputy secretary, said that the department felt it could not ask the commissioner what her legal advice was relating to the commission because it would set a precedent. “We felt we were walking on eggshells in relation to this, that we couldn’t ask the commissioner what advice she had,” O’Leary said. O’Leary also said that there were limits to what the department could ask about the O’Higgins Commission, whose hearings were held in private. “We took the view the confidentiality of the commission proceedings was absolute and it wouldn’t be appropriate to ask the Commissioner anything which would impinge on that,” O’Leary said. Noel Waters, the former secretary general in the Department of Justice, said he had not remembered a meeting in May 2016 with the minister, but his memory was refreshed when he was shown notes of the meeting taken by the minister’s special advisor. He said there was an agreement among those present at the meeting that publishing the Garda Commissioner’s legal advice would be a “a bad idea” and would be “setting up a very dangerous precedent”. The tribunal will hear submissions from legal representatives next Tuesday in relation to the first module held last summer, and plans to begin hearings on its final module shortly afterwards. Email “Tribunal to consider if any evidence of 'dark truth' that commissioner was 'going after' McCabe”. Feedback on “Tribunal to consider if any evidence of 'dark truth' that commissioner was 'going after' McCabe”.